The agency added the Consular Report of Birth Abroad (Form FS-240) to List C. Employers completing Form I-9 on a computer will be able to select Form FS-240 from the drop-down menus available in List C of Sections 2 and 3. E-Verify users will also be able to select Form FS-240 when creating a case for an employee who has presented this document for Form I-9. The agency combined all the certifications of report of birth issued by the Department of State (Form FS-545, Form DS-1350, and Form FS-240) into selection C #2 in List C.
The agency renumbered all List C documents except the Social Security card. For example, the employment authorization document issued by the Department of Homeland Security on List C changed from List C #8 to List C #7. 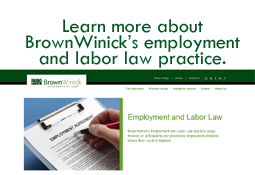 The Handbook for Employers, located here, has been updated to reflect the changes noted above. If you have questions, please contact one of BrownWinick’s immigration attorneys, Elizabeth Coonan or Corrin Hatala, and we would be happy to assist you.